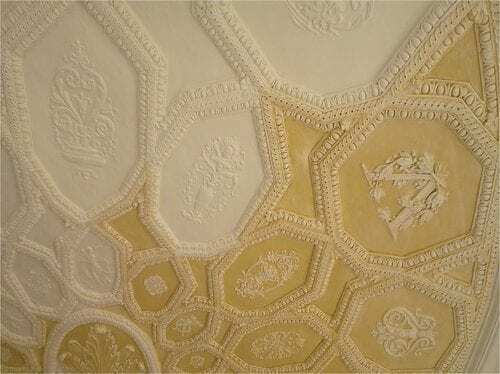 The Plaster Restoration Process | John Canning & Co. The earliest evidence of plaster as a building material is by the Egyptians, some 5,000 years ago. They used plaster made from calcined gypsum that is identical to plaster of Paris. Examples of their plasterwork found in the Pyramids of Egypt and executed circa 2500BC remain durable and hard. Evidence of plaster materials can be found at the ancient site of Mycenae, in Greece, dating back to 1500BC, as well as in Ancient China, and Ancient Rome. Through each age, plaster can be found as a reliable building material whose properties and methods of application have not altered for over 4,000 years. When mixtures containing lime came into use in Europe, the increased density made it ideal for casting dimensional ornament, carving details, and, as it had for thousands of years, accepting painted and decorative finishes. By the mid 1700s, European architecture styles, along with the artisans needed to build them, were making their way to the new world. These styles, some more ornate than others, relied on plaster for the walls, ceilings, and dimensional ornament as much for its durability and fire resistance as for its compatibility as a substrate and medium for decorative finishes and artwork. The grand revival styles of the New World were found primarily in the design of important civic and cultural buildings, churches, and private “palaces.” Now considered historic landmarks, many of them met a variety of fates including destruction, overpainting, harmful or inaccurate restoration, and insensitive adaptive reuse before concerned citizens stepped in to save the history of our evolving culture. 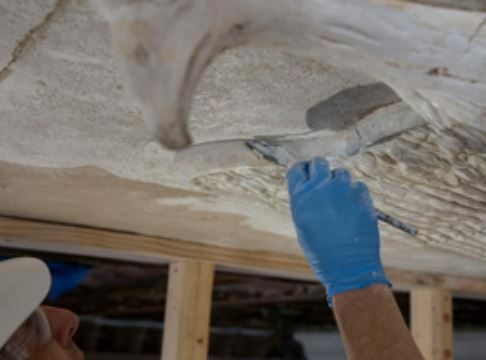 Until the 1970s, there was no collective interest here in the US in formally adopting the conservation techniques, already used in Europe for centuries, to repair and restore historic landmarks. and decoration is only as sound as its substrate. 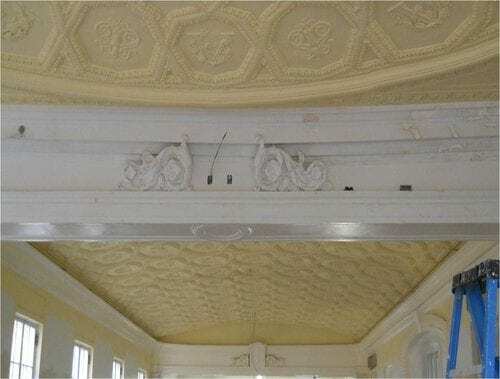 Plaster Survey Before any conservation or restoration can be done, the stability of plaster and condition of its supporting structure must be assessed and stabilized. Plaster damage is primarily caused by moisture, either directly from water leaks, or moisture intrusion in the form of dampness of the foundation it is attached to causing delamination. In an uncontrolled climate, plaster will crack and deteriorate over time from repeated expansion and contraction, again, a result of the innate moisture content of plaster material. 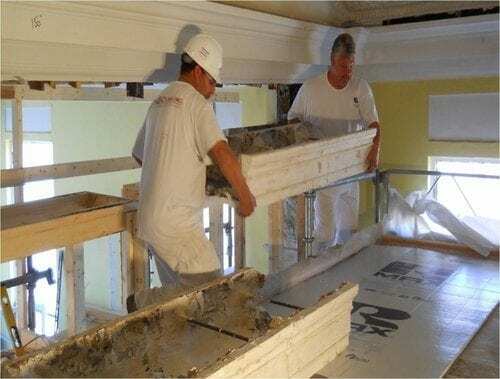 John Canning Company plaster surveys and conditions assessments identify plaster problems and provide treatment recommendations that will stand the test of time. The methods of evaluating plaster construction are not difficult, but they must be comprehensive. Sounding is a way to evaluate the density of the material by using a tuning fork of sorts placed against the plaster. A consistent tone indicates a “sound” substrate. A push/pull test checks for movement and adherence to the substrate. It also measures the force needed to pull the substrate from its framing. These techniques in addition to a close visual evaluation define the conditions of the material. In addition to assessing the stability of the substrate itself, attachment points are inspected. The structural stability of the lath’s attachment to the furring or the furring to a joist is inspected and documented. Our expert staff then develops and implements treatments for crack repair, patching, and consolation and reattachment of loose and damaged plaster surfaces. Many times, stabilizing the plaster must begin with stabilizing the structure to which it adheres. History Designed in the Classical Revival style by Stanford White prior to his death in 1906, and completed by his firm, McKim, Mead and White in 1908, it was built as a dining hall for students living on the University of Virginia grounds. The purpose was to provide a place where students and faculty could dine together in large enough numbers to promote democratic interaction as part of the educational experience. One of three new buildings designed for the campus center, it blended with the original Thomas Jefferson Rotunda design. The Rotunda had suffered a catastrophic fire in 1895. White and his firm had been engaged to redesign and direct the restoration of the Rotunda dome and its interior in addition to providing designs for the new buildings. White adapted the Rotunda interior to accommodate the 1886 needs of the university, but a decision was made in the early 1970s to reinstate the original Thomas Jefferson interior design in time for the nations bicentennial celebration in 1976. Some of White’s 1905 exterior design elements remained, including a Beaux Arts style Eagle on the ceiling of the south portico. 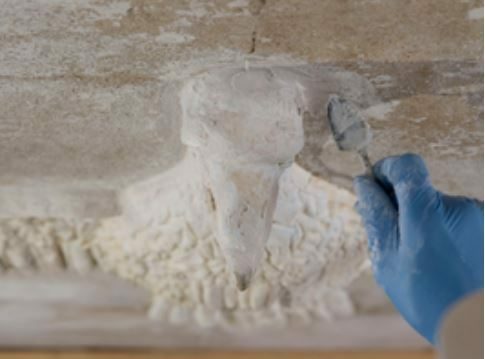 Our firm provided conservation and restoration services to remove multiple layers of paint, reattach the ornament, repair cracks, and replace lost plaster details on feathers and wing tips, and finally, reinstate the original finishes. Condition of Garrett Hall One hundred years after its construction, Garrett Hall exhibited troubling structural damage. Sited on the side of a hill, the pressure of the hillside pushed the building out of square. The walls were no longer plumb, and the ceiling and main supporting beams were detached from the main walls and each other. The decoration, while seemingly intact when viewed from the floor in a 2009 conditions report, proved to be holding together by little more than surface tension once we were able to view it from scaffolding, and more shockingly from the attic space above the dome. At the same time, we conducted a paint analysis with exposures to determine the original finishes and colors for the interior and ornament. Recommendations Once we understood the extent of the wall and ceiling movement, we were able to come up with a plan to create a new framework that would support plumb, flat plaster, interior walls independent of the exterior movement, and build an new steel frame structure to support the beams that were no longer level or functional. Implementation We were able to cut, dismantle, catalog and conserve whole sections of the beam decoration, repairing and reinstalling it once the new support framing was in place. Metal rebar was used to attach plumb interior walls to the slanted exterior masonry. In the areas where decoration was lost, we cast intact decoration and reinstated the missing detail with new plaster elements. Existing plaster was consolidated and conserved. The barrel-vaulted ceiling with low, thin-relief, individually cast coffers was just as challenging structurally. As the dome moved, the coffers began to droop. In some places, little more than surface tension held them together. Thin tie-wires were used for repair during the 50s, but snapped, further compromising the ceiling as it continued to shift. Our evaluation of the structure supporting the ceiling showed alarming inconsistencies and loss. The original wood frame had been shoddily built. The dimensional lumber used for the trusses were not of the same dimension or evenly installed. The furring strips attached to the frame and holding the plaster were also inconsistent in placement and size. The third element compromising the stability of the ceiling was the way the furring framework had been attached to the support truss. Only one nail was used at these intersections. With movement, these nails were backing out. These conditions created not only a restoration problem, but also a safety hazard far more serious than anyone had thought. Honestly, it was surprising that ceiling coffers hadn’t yet fallen. 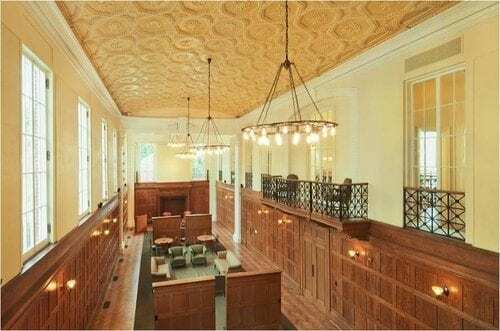 With the perfect storm of sub-standard structural issues, it was clear to us that conserving the decorative ceiling would mean rebuilding the entire framing structure. Presented with the facts, the owners agreed and we were able to rebuild the framework. And, using an ancient wad attachment method, secure the plaster coffers to the furring frame, and furring to the ceiling joists, for the first time tying all of them together to create a stable and secure ceiling for the first time. 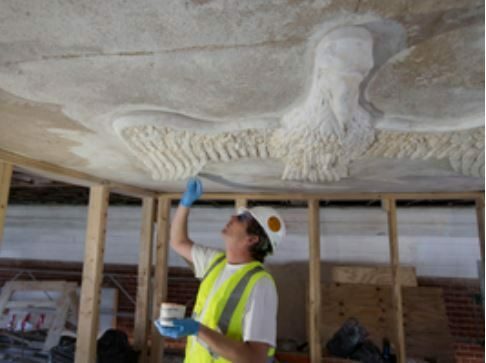 This method, a combination of plaster strengthened with horsehair, provided both stability and flexibility to allow for typical structural movement common to all buildings. Our original assignment was to reinstate the ceiling finishes from a previous restoration in the 1950s. But with the extensive work needed to repair the ceiling, it was just as cost effective to install a late 1800s decorative paint scheme with glazes both based on our paint study results and inspired by other period schemes of that time.